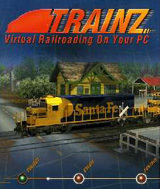 All aboard!Trainz is the most detailed and immersive railroad experience ever, letting you control almost every aspect of a working railroad. Let your imagination run free as you create stunning 3D worlds, take charge of thousands of tons of heavy freight or simply keep your passengers happy as you take on the challenges of a real train engineer. Add to the excitement by controlling multiple locomotives, coordinating activities, switching junctions and ensuring each train arrives safely at its destination. Driver Assemble your favourite trains in preparation for a busy day of operation. Climb into the 3D cab and take charge of passenger runs, shunting yard exercises and heavy freight movements. Choose from the simple or realistic controls, or a completely different perspective, switch on the autopilot and operate all the junctions as you ensure the safe and smooth running of your own private railroad. Scenarios add a whole new dimension to the gameplay. Surveyor Create stunningly realistic layouts! Move mountains, construct cities, create dense forests and lay your tracks, roads and power lines using this powerful and intuitive world editor. Add life to your creations by controlling the weather conditions, setting the lighting moods and adding animated industries. Choose from the 1000s of different scenery and trackside objects, download new content, or create your own. My Collection Examine the stunningly detailed and extensive collection of more than 130 different locos, passenger cars, freight wagons, tank cars and cabooses! Study powerful diesel workhorses from Britain, classic switchers from the USA or high speed electric passenger locos from the Continent. You can also check out all your downloaded custom content including steam locos, traction engines and more. Comments: This is okay, kind of boring but it's a twist from the mind games. I wish you had more views from the drivers seat. Comments: This game is like riding a real train or conducting the train.